Running socks tend to be more durable than average socks. Made from breathable, wicking fabrics, they are also designed to draw away moisture from the feet, keeping them cool and dry in order to improve comfort and minimise risk of blistering. They come in varying levels of thickness – from extra thin to thick and padded, depending on your preference. Choose those with a bit of padding underfoot for long runs, or double layered options if you’re prone to blisters. 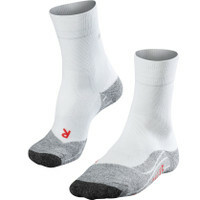 Running socks are available in 3 different lengths, either no-show (socklets) which come just above the shoe line, anklets just above the ankle, or crew which come up to the calf. 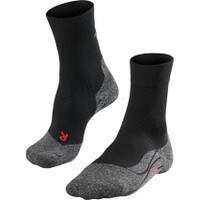 We have a choice of running socks, including toe socks and compression socks. 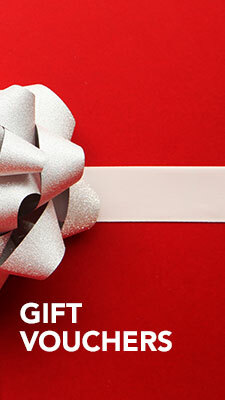 Compression socks help to support your muscles and reduce fatigue. It’s important that they fit well but not too tight – the idea is to improve circulation rather than cut it off – so get a tape measure, measure around the broadest part of your calf and then match that against the size guide on the individual sock pages. 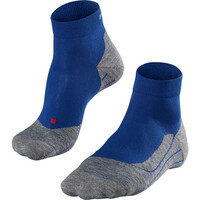 Look out for toe socks too, designed specially for barefoot shoes.